Leading independent oil company Phoenix Petroleum Philippines, Inc. recorded a banner year in 2017 with triple all-time highs in sales volume, revenues, and net income on core business. Phoenix posted a net income of ₱1.792 billion in the full year of 2017, a 65% growth from ₱1.092 billion in 2016. Taking out the non-recurring gains and costs related to the newly-acquired LPG business, core income still reached an all-time high of ₱1.421 billion, or a 30% increase year-on-year. The 2017 results include the partial consolidation of the LPG business beginning August 2017. The group reported ₱44.426 billion revenues, 45% higher than 2016. The solid full year core income growth underscores the strength of the fuels business, in which sales volume increased by 17% to 1.76 billion liters from 1.5 billion liters in 2016. Contributing to the growth were higher sales volume from the addition of new stations, acquiring of new direct commercial accounts across various industries, as well as the consolidation of the LPG business. As of end 2017, the Company had completed 530 Phoenix retail service stations nationwide. “Phoenix Petroleum’s momentum in 2017 is a result of its investments over many years in its people, products, and partnerships. We will continue to be opportunistic as we grow the business,” said President and CEO Dennis Uy. While delivering strong organic growth, the Company continues to invest in new revenue and profit streams. In the past 12 months, it completed two acquisitions, marking its foray into the higher margin business of LPG and convenience retailing. LPG and convenience stores (CVS) are underpenetrated markets with tremendous domestic growth potential as they benefit from consumers’ growing purchasing power and evolving lifestyle. The acquisition of Petronas Energy Philippines, Inc. (PEPI) was completed on August 2017. PEPI has been renamed to Phoenix LPG Philippines, Inc. and owns and operates the Phoenix Super LPG brand. Meanwhile, the Philippine FamilyMart purchase was completed on January 2018. Further strengthening the Company’s portfolio was the establishment on September 2017 of PNX Petroleum Singapore Ltd. Pte, the petroleum trading entity of the Phoenix Group which is envisioned as enhancing the petroleum importation efficiencies of the Phoenix group’s import flows as well as providing access to fast growing markets in Southeast Asia. In addition, earlier this year the Company announced its joint venture with Tipco Asphalt of Thailand and PhilAsphalt for the marketing and distribution of asphalt in the Philippines. The newly formed JV forms part of Phoenix’s strategy to complete its petroleum product offerings and to optimize the expected growth in infrastructure spending of the government. TIPCO Asphalt is the leading manufacturer and distributor of asphalt products in Thailand and the Asia-Pacific region. Its asphalt products are also sold to importers and road contractors in Africa, Australia, and North America. Just recently, Phoenix Petroleum launched its upgraded fuels powered with Phoenix PULSE Technology. Available in all its fuel products, Phoenix PULSE Technology is an innovative formulation with advanced cleaning and protection properties for enhanced power and acceleration. The Company also continues to strengthen its retail network with a nationwide refurbishing of its stations to a new and better look. It opened its 100th station that sports the new design, reflecting the company’s aspiration of becoming the next generation fuel company catering to the needs of the next generation drivers. 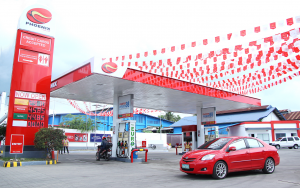 In just 15 years, Phoenix Petroleum has grown from five stations in Mindanao to 530 nationwide, establishing its reputation as the fastest-growing oil company in the Philippines. The company marked its 10th Listing Anniversary on the Philippine Stock Exchange on July 2017, and is the first oil company to list after the Oil Deregulation Law was passed in 1998. Phoenix Petroleum is engaged in the nationwide trading and marketing of refined petroleum products, including LPG and lubricants, operation of oil depots and storage facilities, hauling and into-plane services; convenience store retailing; and trading and supply. With its vision to be an indispensable partner in the journey of everyone whose life we touch, Phoenix Petroleum is committed to deliver world-class services, empower people, and inspire every Filipino’s entrepreneurial spirit.